Metal Roofing - coming soon to the HOA? - Jackson Contracting Inc.
Metal Roofing – coming soon to the HOA? In many suburban areas, Home Owner’s Associations have guidelines against home owners putting metal roofing systems on their homes. In recent weeks the Metal Roofing Alliance (MRA) has called upon HOAs to allow more homeowners to make improvements that will help to better preserve and protect their homes from Mother Nature. 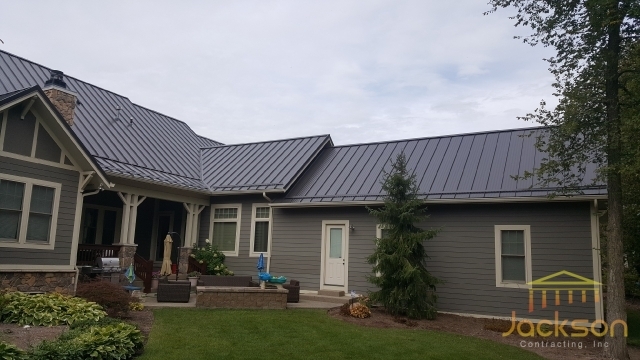 In part, the MRA would like to see more HOAs allow residents to take advantage of all the benefits of metal roofing, including Class A Fire Resistance, Class 4 Impact Resistance and long-lasting durability. Jackson Contracting specializes in all types and styles of metal roofing, to learn more about protecting your home from the elements, give us a call at 317-214-8124. To read the full statement from the MRA click here!